This is just an uber quick reminder that as per my previous post, I have now updated the domain for the blog from http://www.tekhead.org to http://tekhead.it. The changes went live tonight (27/02/2016) around midnight, and all previous blog paths are now 301 redirected to the equivalent address on the new site. Hopefully I won’t lose too much Google juice with the new address! So, if you have any difficulties whatsoever accessing paths or content, please let me know via Twitter, and I would be very grateful! Wow! Little did I think that when I posted my first couple of silly posts in May 2010, that 6 years later I would actually be doing this thing on a regular basis and that it would have given me so many amazing learning and networking opportunities! I’m sure it’s a great product, but frankly as a novice blogger it was really not a friendly platform, which discouraged me from actually using it, and for the first two years I managed a sum total of three posts! Woohoo! I then made what was in hindsight, a very sensible decision to switch to WordPress. 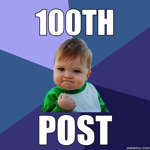 Since then I haven’t looked back… averaging a couple of posts every month for the past 4 years. The funny thing I have found about blogging over this time is that I do this mostly for the enjoyment of writing and sharing information etc, yet I find myself in a permanent state of mental flagellation over not producing enough content or publishing often enough. Like everyone I have my excuses, not least my two small children and crazily busy job, but I do what I can! I am always in awe at the amount of content some bloggers manage to generate, whilst still staying sane and having a personal life! I don’t believe I’m the only one who feels like this… Perhaps we should start a support group and give the condition a name? How about “Bloggers Contrition”? As to the title above, if you are a regular visitor to the site you may already have noticed some small changes going on with the domain name and titles. I am not rebranding, but I felt that switching from .org to .it and dropping the www was a nice way to give the site a bit of a refresher going into 2016. The process itself will probably take me a couple of weeks to complete as I want to make sure I have all of the right 301 redirects in place before the final switch, but I am not anticipating this being a huge issue. If for any reason you happen to spot any of the content becoming unavailable, please let me know via a wee tweet! Anyhoo, I’ll just wrap up by saying thank you all very much for allowing me to continue ranting on this little corner of the internet and for all the positive comments and feedback over the years. I shall endeavour to keep it up – if I can think of anything to write about!